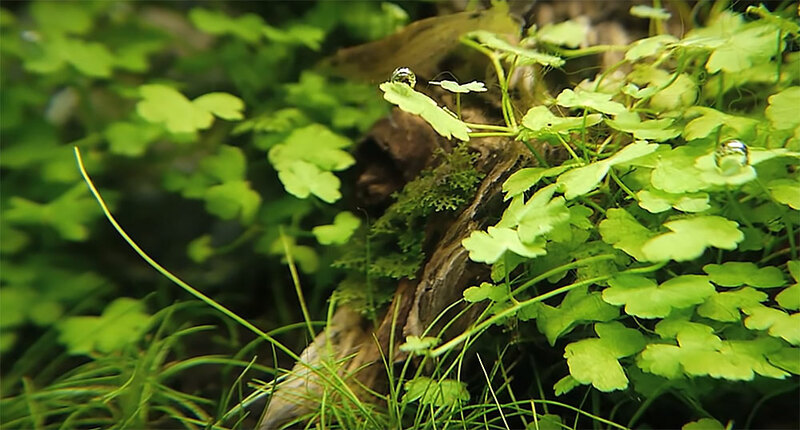 ﻿ Video: Ray Motoyama's Mini Forest Makes Me Want A Planted Tank! A snapshot of Ray Motoyama’s ever-evolving Planted Aquarium; an ADA Mini L, 32-liter tank light by an ADA Aquasky 451. It’s filtered with an Eheim 2213, and receives CO2 and is fertilized with the EI (Estimative index) dosing method. 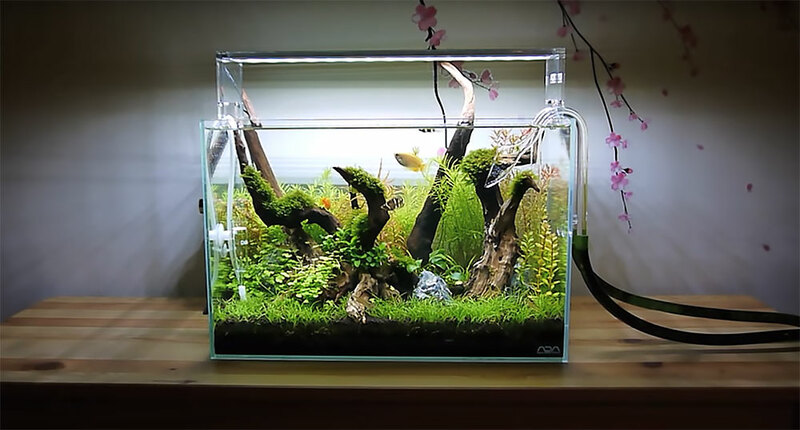 Ray Motoyama’s 32 L planted tank is proof that small can be stunning. For some reason, everything about the presentation of this beautiful 8.5-gallon (32-L) planted aquarium speaks to aquarists of different skill levels and says “you too can do this.” As is the case with many fine works of art, its simplicity is deceptive. Sphaerichthys osphromenoides, the Chocolate Gourami, at upper left, and Epiplatys annulatus, the Clown Killifish, tucked in at lower left; both are intriguing fish choices for Motoyama’s planted aquarium! 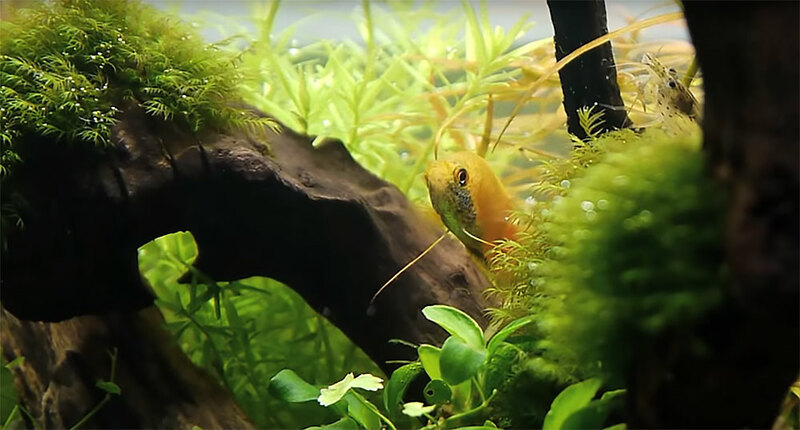 A male Honey Gourami, Trichogaster chuna, brings an often overlooked species back to our attention. Amano Shrimp, Caridina japonica, lurking in the background (top center) prove that you dont’ need gaudy invertebrates. These let the plants, along with the small, sometimes cryptic but brightly colored fish selections steal the show! 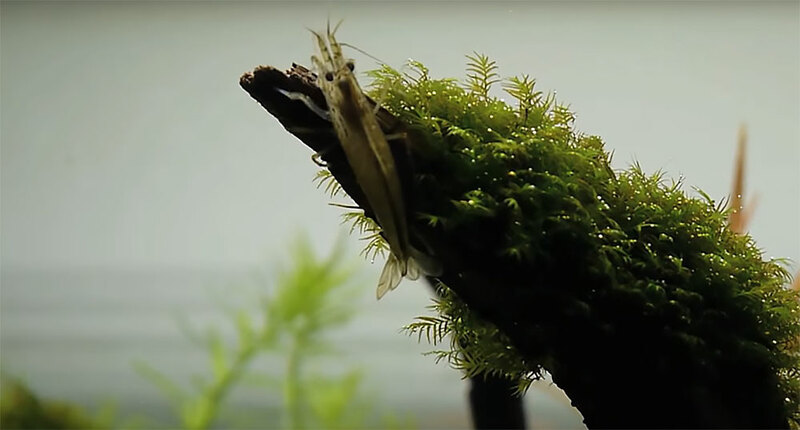 Amano Shrimp, Caridina japonica, frolic among the mosses. The plants? Motoyama lists his species in this layout as including Eleocharis parvula, Hydrocotyle tripartita ‘Japan’, Anubias nana var. ‘Petite’, Rotala sp. “Green”, Rotala nanjenshan, Rotala colorata, Rotala sp. “Mini”, Ludwigia arcuata, and Fissidens fontanus. Remember that part about it being deceptively simple. In reality, this layout is likely the work of months of trial and error along the way. 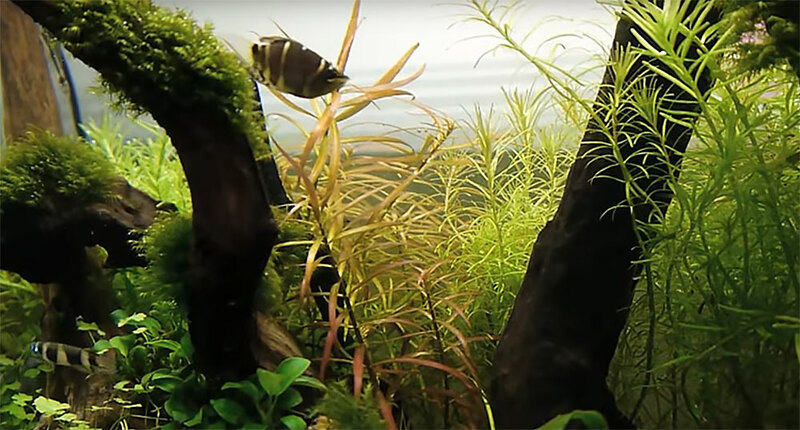 The Mini Forest layout is just one aquascaping iteration out of many past, and future ones, that Motoyama created with the same basic materials in the same tank. Here’s a look at one of his “teardowns” and re-aquascaping of the same tank, less than a year prior. You can watch the entire history of this aquarium, as Motoyama takes it from one iteration to the next, watch his Youtube Channel. Based on his past pace, it may be due for an update any day now!